J took one more day off after we got back in Michigan just so we could relax after a long weekend of traveling. We were woke up fairly early for us by a phone call and neither of us could fall back asleep. After going to the Potter Park Zoo during the “Be A Tourist In Your Own Hometown Event” we kept saying we needed to walk the River Trail. We noticed it from the zoo, but we never made an effort to actually go for a walk. Since we had such a bad weekend eating (I had four pizzas), I suggested we go for a walk. Since it was about lunch time, J said we should eat first. I had been reading reviews about a diner on Pennsylvania near the Zoo so that’s where I decided to to go for lunch. After a great dinner in East Grand Rapids, it was time to head downtown for the evenings main event. For my birthday, J bought me tickets to the Taylor Swift concert at Van Andel Arena. I know it’s a little wierd for an almost 30-year-old to want to go to a concert that attracts the tween crowd, but I love Taylor Swift’s music and so does J. She was in town headlining a show for B-93. It was their annual Roof Sit for Kid’s fundraiser. The show started at 7:00 at Van Andel Arena. After some problems with construction around Greater Grand Rapids, we made it downtown at about 6:50. I hate parking garages and the parking near the arena is garages. Not being familiar with Grand Rapids, I didn’t know where to go. We ended up finding another garage a few blocks from the arena. The price was a little bit higher at nine bucks, but at least we didn’t have to deal with horn honking crazy teenagers as we were trying to leave the main lot. We were in and out with no problem. Rose’s on Reed’s Lake was an incredible find. 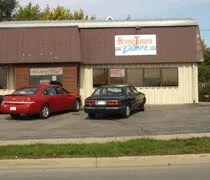 The restaurant had been suggested last time we were in Grand Rapids by two of J’s co-workers. We passed wanting to check out downtown. We should have took their advice. The last trip was kind of a bust because we couldn’t find any walkable areas. 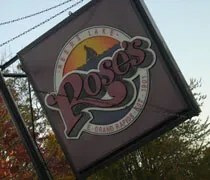 Rose’s on Reed’s Lake is close enough to what I’m guessing was downtown East Grand Rapids which is easily walkable and really cute. We had a really hard time getting to Rose’s. 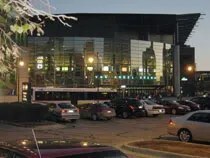 We were in Grand Rapids for a concert at Van Andel Arena. The idea was to have a nice leisurely meal. We left my parents in Illinois six hours before the concert. It was a three and a half hour drive and we wanted to make a stop in Michigan City, IN at the outlet mall. I thought we’d have plenty of time. That was, until we hit construction. I couldn’t hold it anymore and had to get off a heavily torn up portion of I-196 to find a restroom. It took us 15 minutes to find our way back to the Interstate due to ramps being closed. After that, we finally make it to Lakeside Drive only to find it closed due to construction. Luckily, we had a GPS that brought us to the next road which was also closed due to construction. Finally, we made it to a road that was open and weaved our way back to where we needed to be. I’ve always thought it was weird to rave about gas station food, but Casey’s General Stores are better than a lot of quick service restaurants. 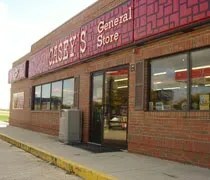 Like most things I loved about Central Illinois, there are no Casey’s in Mid-Michigan. The closest would be in Mishawaka, IN. There are Casey’s all over the place in Illinois. It seems like every little town has one. There was always a running joke at my last job. I worked in TV news and on Friday night, we would shoot a lot of high school football. When you got sent to a school you were unfamiliar with, the Sports Director would always say “Turn at the Casey’s” and chances are, you’d end up at the school. We stopped in Peotone on our way back to Michigan. Niether of us had eaten yet. The plan was to have dinner in Grand Rapids before the concert so we didn’t want a big lunch. I thought there used to be a Taco Bell in Peotone so that was the original plan, but when we got off and saw there wasn’t, but there was a Casey’s, our plans changed. To me, the best thing about Casey’s is the pizza. It’s crazy that some of the best pizza I’ve ever eaten comes from a gas station, but it does. There was a Casey’s just down the street from my old job and there were many nights we’d order pizzas from there. They do sell pizza by the slice since it is a gas station and most people who stop in are just looking for lunch. We both passed on that today and instead, grabbed a cup of popcorn chicken. J’s favorite is the cheesy potato bites, but they didn’t have any of them. They did have loaded potato wedges, but we thought that would be too hard to eat in the car. The other options at this time were cheeseburgers or chicken fingers. Like I said, we both grabbed the popcorn chicken because it would be easy to eat in the car. J grabbed a couple packets of dipping sauce for hers, but I went au natural. It was easy for me to put my cup in the cup holder next to the steering wheel. Easy access while I was driving. Monical's Pizza in Gilman, IL about 40 miles north of Champaign. This isn’t the first time I’ve blogged about Monical’s, so I won’t rehash the whole history. If you’re interested, there’s more information on my review about the store in Champaign, IL (review HERE). 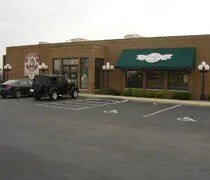 As a quick recap, Monical’s is a Central Illinois based pizza chain that my family ate at very often. The choices were either Pizza Hut or Monical’s. Like everything else with my family, I chose Pizza Hut because I liked their bread sticks better and everyone else chose Monical’s, so we ate at Monical’s a lot. Even though J grew up in Illinois, she had never been to a Monical’s. They don’t go that far north, but there were a couple stores in the Peoria area where we lived before moving to Lansing. We still never ate there.